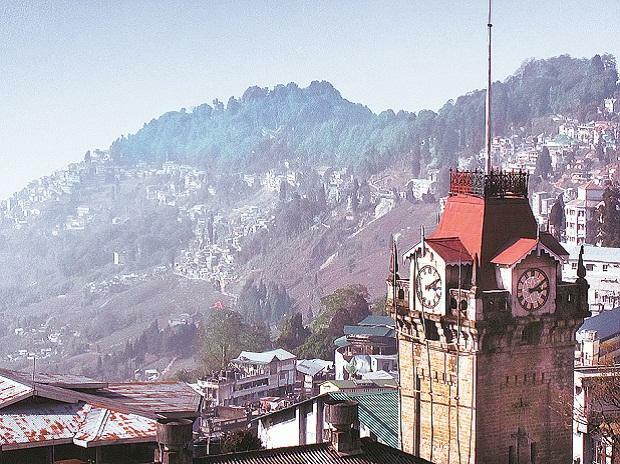 Among the 42 seats from West Bengal which goes to Lok Sabha polls from next month, the Trinamool Congress (TMC) and the Bharatiya Janta Party (BJP) are poised to fight a pitched battle this time over control of Darjeeling. While the BJP will vie to retain this seat, the TMC is desperate for its maiden Lok Sabha foray from this constituency. It was with the Darjeeling Lok Sabha seat that the BJP staged a comeback in West Bengal after its decline in 2004. Apart from Darjeeling, the BJP won the Asansol constituency in the previous Lok Sabha elections. On the other hand, since its inception in 1998, the TMC hasn’t been able to win from the Darjeeling constituency even once. The ethnically sensitive Darjeeling is dominated by the Gorkhas and dotted with the Lepcha, Tamang and other minority communities, who have long cherished the dream of an independent state under the name of Gorkhaland, which until now has been a myth. The otherwise picturesque landscape has been mired in political tensions, ranging from killings to loot and arson to indefinite shutdowns in pursuit of this dream. After the 104-day bandh in Darjeeling came to an end two years back, the Gorkha Janmukti Morcha (GJM) had come to terms with its arch-enemy – TMC, which so far, hasn’t been able to open its chapter in the Hills. With GJM supremo Bimal Gurung officially absconding, the reins of the party passed over to Binay Tamang, who otherwise, has been on favourable terms with the TMC. With the announcement of the TMC candidate list, party supremo and West Bengal’s chief minister, Mamata Banerjee had made it a point that the TMC’s flagbearer in the Hills is not only a seasoned politician of repute, but also a popular local among the Hill people. The natural selection thus fell on Amar Singh Rai, a former Gorkha teacher who joined politics under the GJM banner and has been representing Darjeeling in the state’s Assembly. While a section of the Gorkhas hold Rai in high esteem, he switched banners to join TMC to fight for the Lok Sabha polls. On the other hand, the BJP responded by fielding a fresh face - Raju Singh Bista, a Gorkha from Manipur who replaced the candidature of the incumbent S.S. Ahluwalia - who won from the Darjeeling constituency last time by over 1.5 lakh votes. Leaders from the BJP as well the TMC view the situation “quite different from the past” in Darjeeling and political observers are ready of going to the extent of terming Darjeeling a complex web and utter chaos. While the leaders from the TMC camp believe that Rai will be instrumental in getting the votes for TMC and the Tamang faction within the GJM will support Rai’s claim for a Lok Sabha seat, BJP leaders are resting their confidence in the BJP-GJM-Gorkha National Liberation Front (GNLF) alliance and Gurung backing its candidate. “Darjeeling has been a safe seat for us so long but its not the case now with changed political equations. The fight this time will be head on”, Chandra Kumar Bose, vice president of the BJP’s state wing said. On the other hand, the declaration of Bista as the BJP candidate has added further insubordination within the GJM ranks. Its central committee member Swaraj Thapa quit the party in protest after writing a stinker to Gurung terming Bista as an outsider even though BJP’s candidate is an ethnic Gorkha. 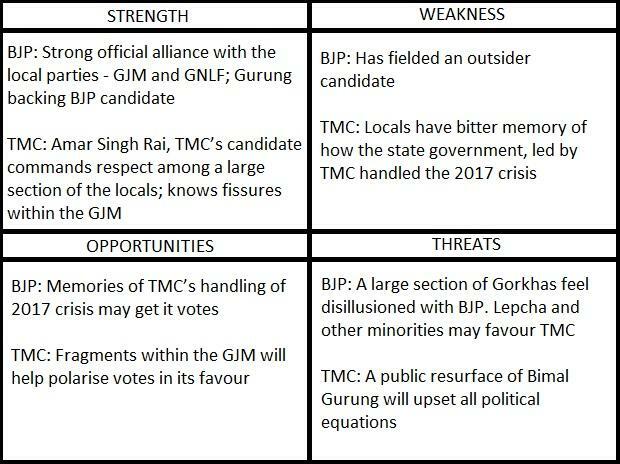 Political commentators note that the otherwise localised GJM, after years of in-fighting, has been reduced in strength substantially with too many factions inside this party, which other political parties can harvest. A political analyst noted that the state government’s creation of separate boards for ethnic minorities under the semi-autonomous Gorkhaland Territorial Administration, has led the Tamang, Lepcha and other minority communities to distance themselves from the Gorkhas, who are the dominant community in the Hills. “However, Gurung still commands respect among the voters in the Hills while Tamang has limited acceptability. On the other hand, although Rai is revered, his switch of allegiance to the TMC hasn’t gone too well with the locals. If Gurung, from his hideout, is able to mobilise his supporters, then BJP has a fair chance of winning this seat”, political commentator, Sabyasachi Basu Roy Chaudhury opined. However, like Thapa, he cautioned that Bista, on the other hand, is an outsider for the people of Darjeeling which may work against his ambitions. Roy Chaudhury is of the view that while the people of the Hills feel disillusioned with national political parties like the BJP, they don’t view the TMC as a friend either. “It is an extremely complex and prickly situation in the Hills. I think there won’t be a rerun of 2017 atleast now; but once the results are declared, the losing political party or the faction will not let go their defeat so easily”, he added. In 2017, after the state government ordered an audit of the GTA, political tensions escalated to a 104-day bandh. The BJP, since the last two Lok Sabha polls, has been in alliance with the GJM with the latter extending their support as they claim it is in their best interests of realising Gorkhaland. Gorkhas' support for the BJP is not based on the ideological leanings of this party, but the BJP’s sympathetic stance towards Gorkhaland. Although no promises of separate statehood had been made officially, the Gorkhas, till 2017, believed that the GJM-BJP alliance was the only way towards making Gorkhaland a reality. However, neither Jaswant Singh, nor Ahluwalia, who had previously won on a BJP ticket from Darjeeling, frequented the Hills and in the 104-day long shutdown, which ended on September 27, 2017, the latter remained a mute spectator to the crisis. A BJP leader admitted, “The Gorkhas, who are a martial class and most of whom are either active or retired army personnel, have high regard for Netaji (Subhash Chandra Bose). He is probably the only Bengali which the Gorkhas love and admire. Over the years, Mamata Banerjee has been celebrating Netaji’s birthday in Darjeeling which has been drawing huge crowds and to some extent, has been converted into some support for her”. On the other hand, the TMC manifesto has further promised special schemes for the Hill people besides assuring that the party, if voted to power, will examine proposals of state governments on bifurcation of states. While the BJP is aware of the anti-incumbency factor, especially its mute role during 2017, when Darjeeling was caught in its worst eco-socio-political crisis in the recent past, it is again relying on its closest ally in Bengal – the GJM – for a seat with promises of economic and social development; but the TMC knows that it the divisions in this Gorkha party which can pave the way to its maiden Lok Sabha win from Darjeeling.